The ocean can look enormously peaceful, like a postcard sent from heaven by someone on Xanax. Under the surface, things aren't nearly so calm and picturesque. And on the coast of North Africa, the U.K.'s Royal Navy found another salty hazard: Two previously unmapped underwater mountains, jutting up from the seabed. The HMS Enterprise mapped two large "seamounts," measuring one at 1100 meters and another at 930 meters, meaning they're about the size of some of the peaks in the Blue Mountains. Using a hydrographic multi-beam echo sounder, the ship's specialist equipment was able to measure the seamounts in detail. While these types of underwater mountains are hardly a newly found phenomenon, the discovery of new seamounts in heavily trafficked shipping areas like the North African coast are important because, well, ships without knowledge of the massive mounds might run into them. In 2005, the USS San Francisco plowed into an uncharted seamount and almost sank. The collision badly damaged the submarine and killed one seaman, injuring nearly 100 others. This kind of scanning will reduce the number of unknown gigantic dangerous underwater mountains out there, which should prevent accidents. Scientists have already made substantial progress mapping underwater topography from space. 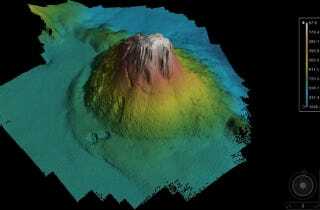 Using satellites, thousands of seamounts were discovered just last year.